﻿We at the Roger C. Wilson Law Firm. PC have helped many clients to overcome DUI and related charges, by negotiating reductions or dismissals of charges, and by successfully trying cases to verdict successfully for our clients when such pretrial resolutions could not be obtained, We are expert in the law and science involved in this area, We are vigorous and creative in our handling of cases. We are closely involved with our clients in seeking the best resolution available, given the client's situation and goals. And we are always ready to fight for our clients' complete vindication at trial when necessary. Criminal convictions for driving while intoxicated (DWI), or driving under the influence (DUI) of alcohol or drugs--even just the existence of these charges--can wreak havoc in one's life. They can easily cause the loss of a job. They can result in very expensive fines and other penalties, the loss of one's driver's license for a year or more, and imprisonment. These charges must be addressed promptly and actively. Delay in dealing with them will only harm, very possibly destroy, a defendant's chances of a successful resolution--maybe even a dismissal-- of the case. DUI charges should be handled by a lawyer specifically skilled and experienced in this area. All aspects of DUI cases contain many inherent complexities: the applicable laws as well as the areas of science and medicine involved. Without knowledge and experience in all these areas, it is not possible to fully and vigorously defend a DUI case. In each of these areas--the law, the science, and the medicine--there are potential bases of challenging a DUI arrest and charge. Thus, expertise in all of them is necessary in order to avoid failing to recognize or effectively utilize all such defensive bases that may exist. 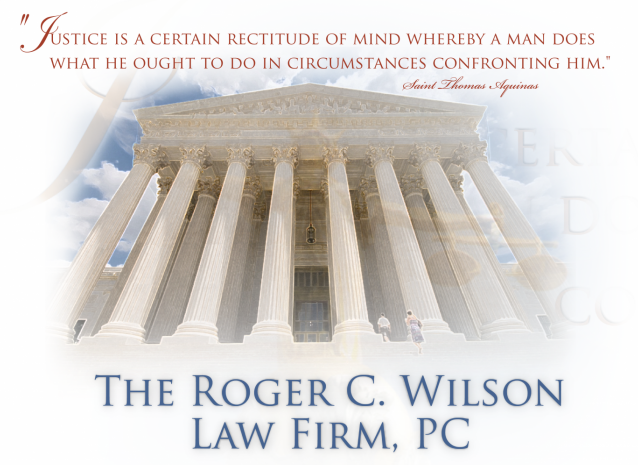 ﻿﻿﻿﻿The Roger C. Wilson Law Firm, PC is are a small Atlanta law firm with big-firm experience and expertise. We offer the best of both worlds: the highest quality legal skills, and a small, personalized environment. This enables us to provide comprehensive direct contact and individualized attention to our clients, always pursuing their particular needs and goals, and not a generic, anonymous "road map" to DUI cases. ﻿﻿﻿﻿﻿﻿﻿Roger C. Wilson is an accomplished litigator specializing in federal and state criminal defense, with much experience and success in defending DUI cases at all stages of the legal process and in many different jurisdictions. He has resolved numerous cases pre-trial, with dismissals or reductions of charges. And when such resolutions have not been possible, he has successfully defended DUI clients at trial.